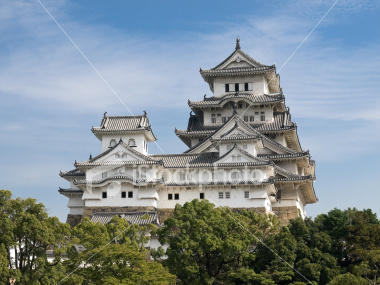 Himeji Castle (姫路城, Himeji-jō) is a flatland-mountain Japanese castle complex located in Himeji in Hyōgo Prefecture and comprising 83 wooden buildings. It is occasionally known as Hakurojō or Shirasagijō (White Heron Castle) because of its brilliant white exterior. Along with Matsumoto Castle and Kumamoto Castle, it is one of Japan’s “Three Famous Castles”, and is the most visited castle in Japan. Landscape view of the main tower of Himeji Castle on the hillside during the daytime with trees of the castle grounds in the foreground and blue sky with thin white clouds in the background. 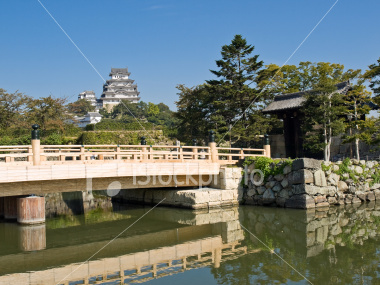 Entrance to Himeji Castle grounds surrounded by a moat with main gate and bridge crossing in the foreground and Himeji Castle with clear blue sky in the background. 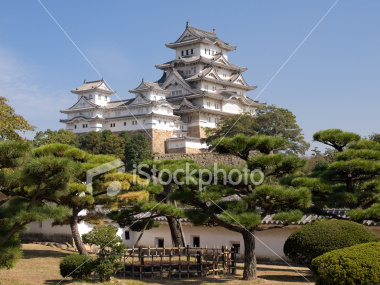 Main tower of Himeji Castle on the hillside with bonsai pine trees of the castle gardens in the foreground.